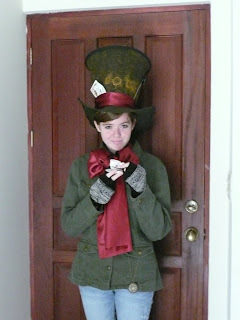 Lindsay saw clips of the new Alice in Wonderland movie and knew that the Mad Hatter was the costume she wanted for Halloween. She did some research and spent a lot of time making the hat, but she totally nailed it! Oh SWEET!!! She did an AWESOME job at it!